Students with a minimum of 50% marks from the Physics, Chemistry and Maths (PCM) science stream in class 12 are eligible to apply. The institute also offers scholarship for students who have scored higher marks. The scholarship is offered on tuition fees, hostel as well as transport fees for studious students. Candidates must procure the application form either online or offline, fill it up and submit it to the institute along with the DD payable to Karpagam Academy of Higher Education, Coimbatore. The application fees is INR 500. The selection will be made depending on the scores of the candidates in their higher secondary and their performance in the entrance exam. Eachanari (PO), Coimbatore - 21. 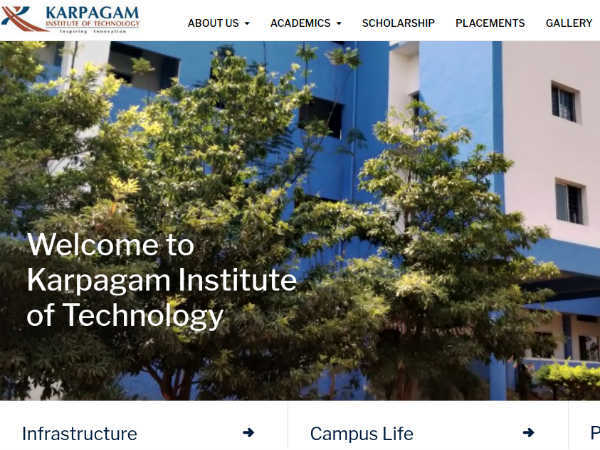 Karpagam Institute of Technology was founded by Dr R Vasantha Kumar. According to the official website, the mission of the institute is impart excellence in technical education and research. The institute is recognised by AICTE and is affiliated to Anna University, Chennai. The list of companies that offer campus placements are available on the college website.